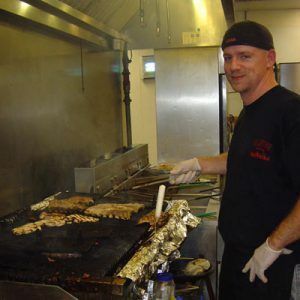 Millstone BBQ, your Hocking Hills restaurant destination. We’re located in Logan, Ohio, in the Heart of Southeastern Ohio’s Hocking Hills region. Our Southern Smoked BBQ meats are all smoked on site for fifteen to seventeen hours. You will notice a pink hue inside called the smoke ring. This unique trait is indicative of our moist, tender BBQ meat that virtually melts in your mouth. Our goal at the Millstone is that you’re greeted warmly and that you go home with a satisfied smile. We hope that our service, fun atmosphere and unique flavors will call you to visit again and again. WATCH LIVE SPORTS – Live sports are always available on our flat screen HDTVs. RESERVATION POLICY: We are taking reservations Monday through Thursday. Friday, Saturday, and Sunday are first come first serve no matter the size of the party. HOLIDAY RESERVATIONS AVAILABLE – Planning a holiday party but don’t know where to hold it? We’re now taking reservations for parties of eight or more. We can even cater it at your location. GIFT CARDS ARE SMOKIN’ HOT! – Buy $50 worth of gift cards and get a complimentary $10 gift card for yourself. Complimentary gift cards are not redeemable on the day of purchase.